The demand for aseptic and convenient packaging formats on the part of the consumer and the need to reduce per-package cost price on the part of the manufacturer are the prime factors behind the emergence and rising adoption of bag-in-box containers across industries. Bag-in-box containers, as against conventional packaging solutions, provide improved hygiene and safety features in addition to greater convenience in packaging, storage, and transportation and low space utilization. While the sales of bag-in-box containers are estimated to amount to US$4,587.7 million by the end of 2024, the market is anticipated to face a major challenge from the introduction of competitive alternate products such as cubitainers. Nevertheless, the surging demand for bag-in-box containers for wine packaging is expected to help overcome growth restrictions and give the global market a significant push to expand at 6.3% CAGR from 2017 to 2024. Based on end use, the global bag-in-box containers market caters to the food and beverages industry, household applications, and industrial liquids packaging companies. 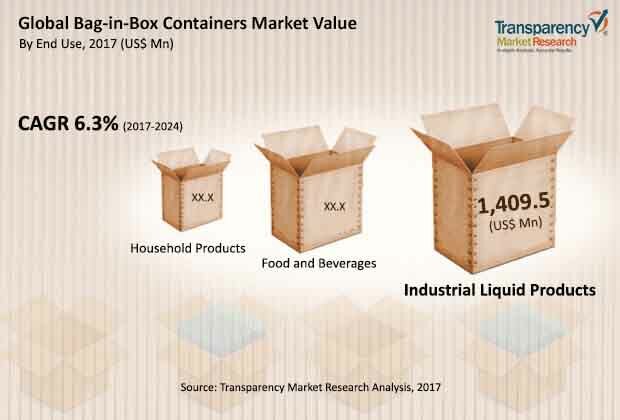 The food and beverages sector dominates the global bag-in-box containers market with a share amounting to over three-fourths of the overall market by end use. This segment comprises alcoholic beverages, non-alcoholic beverages, and liquid foods. The use of bag-in-box containers for household products is anticipated to witness the fastest growth over the forecast period at a 9.1% CAGR over the course of the aforementioned forecast period. Bag-in-box containers are made from low-density polyethylene (LDPE), ethylene vinyl acetate (EVA), ethylene vinyl alcohol (EVOH), and other materials. Low-density polyethylene is the most widely used material for bag-in-box containers and accounts for a prominent share in the global market owing to its high consumption in the packaging of food and beverages as well as household products. Driven by its oxygen barrier properties, ethylene vinyl alcohol is anticipated to gain traction over the forecast period in the packaging of food items and beverages. By the type of received order, the global bag-in-box containers market includes standard orders and customized orders. Bag-in-box containers are mainly available in a standard format and thus, the segment accounts for the maximum share. However, customized bag-in-box offerings are expected to present lucrative opportunities for manufacturers. This segment is projected to expand at a CAGR of 7.8% from 2017 to 2024. On the basis of geography, the global bag-in-box containers market is segmented into North America, Asia Pacific, Europe, Latin America, and the Middle East and Africa. Europe is the largest revenue generator in the global bag-in-box containers market in terms of value and volume. Latin America is anticipated to witness the highest growth over the forecast period, registering a CAGR of 8.0%. The growing demand for bag-in-box containers is likely to boost the Asia Pacific market, with countries such as China and India emerging as major contributors to the growth of the regional market. Prominent bag-in-box container manufacturers have been significantly investing in these countries in the recent past. The bag-in-box containers market in MEA is expected to witness moderate growth in the coming years. Prominent players in the global bag-in-box containers market include Smurfit Kappa Group, DS Smith, Amcor Limited, Liqui-Box, Scholle IPN, CDF Corporation, Vine Valley Ventures LLC, Parish Manufacturing Inc., TPS Rental Systems Ltd, and Optopack Ltd. Companies have been mostly focused on geographical and capacity expansions in order to secure a top spot among the global leaders.